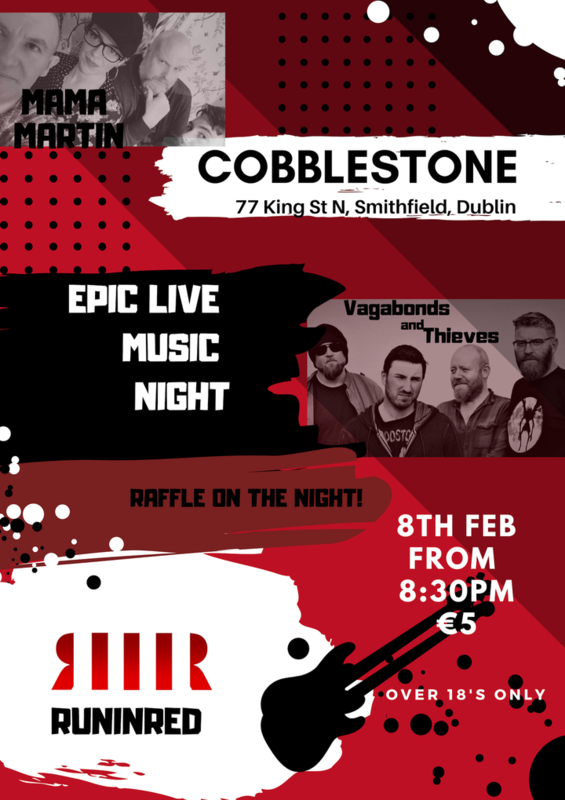 The Cobblestone Presents EPIC Live Music Night filled with Rock tunes in support for Empowering People in Care Ireland! EPIC advocates at a national and local level for the rights of young people in and with care experience, promotes the voices of young people in and with care experience and base advocacy on meaningful engagement with young people, documented data and commissioned research. !!! RAFFLE TICKETS ON THE NIGHT!!! Band trio on the night: Mama Martin, Run in Red and Vagabonds and Thieves!!! Formed in August 2014, The Mama Martin Band melded together an array of musical styles, to create an energetic and melodic mix of pure rock and roll magic. Frontwoman Andrea Martin holds the crowds with her unique brand of sass and vivaciousness that helped the band to victory, at the Radio Nova Battle of The Bands 2014. RunInRed is an Indie Rock band with members from the Dublin, New York and UK music scenes, in 2017 the band released their debut EP: ‘The Revelled Theory Mind.’ Its lead singles have drawn praise from JOE.ie, TogetherFM and have been play listed on Pandora Radio in the US. Formed in Kildare in April 2014, Vagabonds and Thieves setup of guitar, bass, drums and bouzouki to deliver foot stomping Blues, delicious folk and Rock music. Having done locals on Nova the band then got asked to do new Irish music scene show on KFM, the tracks recorded have been played on the following weeks. Vagabonds and Thieves have no fear in adding and mixing sounds to make your soul jumps in joy.